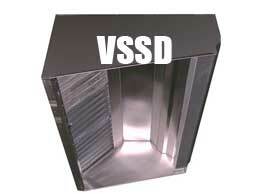 The advantage of our NSF®-certified VSSD and BSSM style hoods is that the make-up air (MUA), which is air channeled directly from outside the building, goes directly into the hood where it is needed and not on top of the cook's head, which is where external make-up air plenums typically blow. Having the air ducted directly into the hood provides a more efficient, economical , and comfortable system overall. For medium-to-heavy cooking. The best choice for standard or higher ceilings. The increased supply air volume can be more equally distributed in the hood; up to 100% of exhausted air can be supplied into this hood. Installed light fixtures are included as standard in this hood (1 per every 4 linear ft of hood), along with the filters and grease cup. Standard measurements are 48" front-to-back, 24" top-to-bottom, and from 4' to 16' in length. 100% stainless steel construction, with aluminum filters and grilles. Also available in an ETL-listed style. For medium-to-heavy cooking. Optimal for kitchens with lower ceilings or anywhere increased headroom is required. The 16" standard front allows for 8" additional headroom over a box hood, while the 24" tall back maintains the optimum area for capturing grease-laden vapors. Standard measurements are 48" front-to-back, 24" tall back, 16" front, and from 4' to 16' in length. 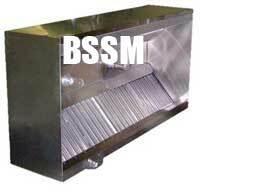 100% stainless steel construction, with aluminum filters and grilles.